SpongeBob Squarepants has been a cultural phenomenon for 15 years. 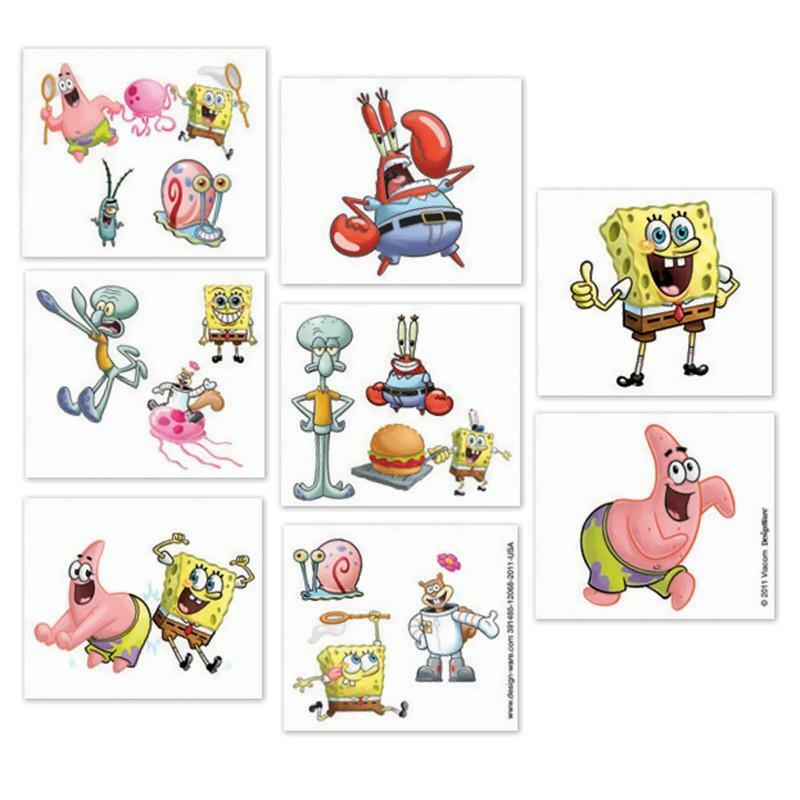 Since the first episode premiered on Nickelodeon in 1999, through almost 200 episodes, three animated films (two for television) and now a recent blockbuster 3D movie, SpongeBob’s popularity has maintained throughout the years, transcends the ages, and is currently on the rise. Kids and adults alike are drawn to his optimism, moxie, and stick-to-it-iveness. We all know he’s absorbent and yellow and porous (it’s right there in the theme song), but you know what else he is? He’s cool. He’s hip. He’s “what’s trending now,”and he has been since before we all knew what “trending” meant. If you’re still a little fuzzy on the subject, ask your kids. They get it. Just look at them while they’re watching an episode–they’re tickled pink. Everyone knows that kids of all ages love SpongeBob, but did you know that ever since its heyday, 40 percent of the show’s viewers are adults? Who are we kidding, OF COURSE you knew that. You’re probably one of those adults who watch the show, or maybe at least you used to. Hey, your kids have to have gotten it from somewhere, right? And your kids love Spongebob, almost as much as Mr. Krabs loves money. 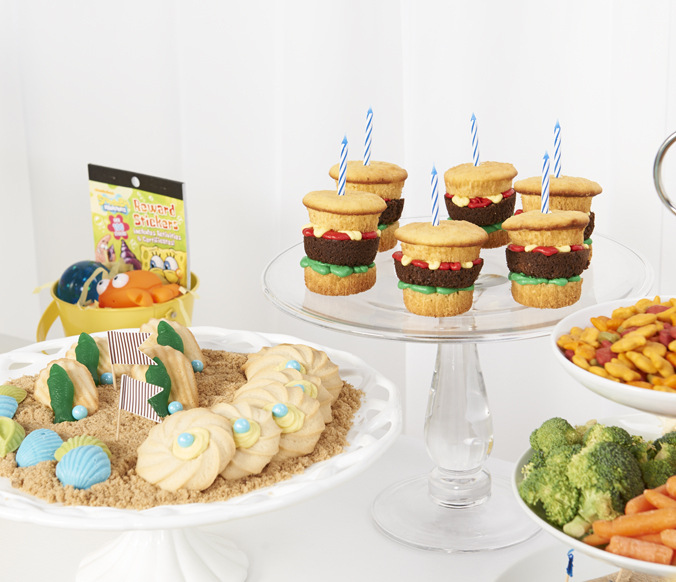 So if you don’t want the birthday boy or girl to be as grouchy as Squidward on their special day, you need to throw the best Spongebob party this side of Bikini Bottom. And we’re here to help you pull it off. 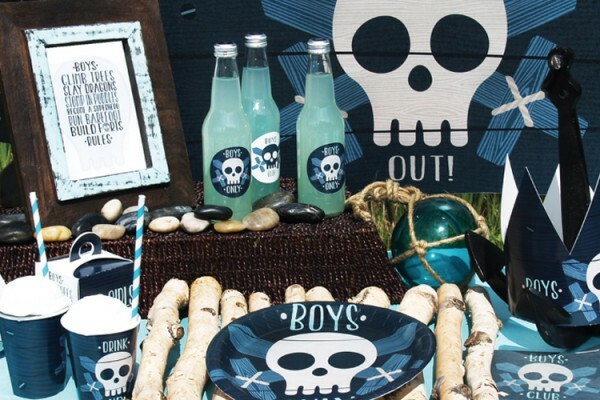 Check out this alternate party design, featuring products personalized with your child’s name and photo. 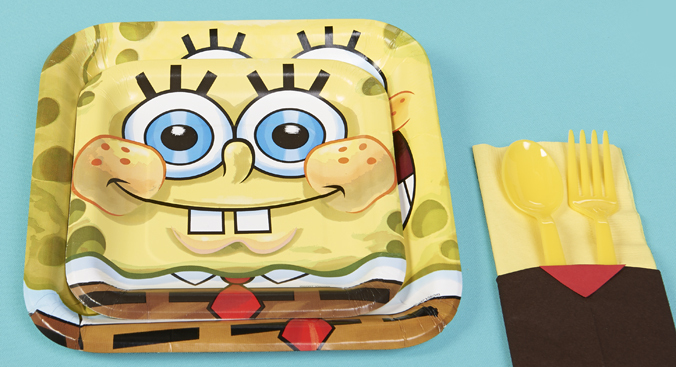 And click here to see some simply amazing Spongebob cake designs! 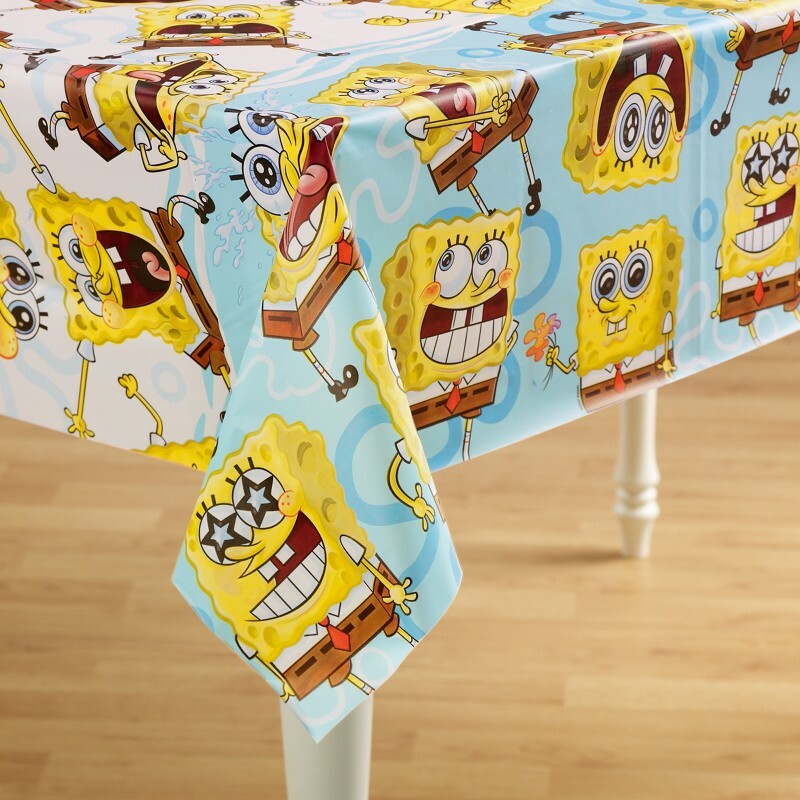 To turn your table into a Bikini Bottom beach bash, start with this great tablecover. Then add plates, cups and napkins. Just get some napkins in yellow and brown. Fold yellow napkins lengthwise into thirds, tucking the edges in the back. Place a yellow plastic fork and spoon on top. Cut the brown napkins in half and then wrap it, folded, around the yellow napkin and secure with tape in back. Cut some small red triangles from red construction paper and tape to the top center of the brown folded piece to create SpongeBob’s “tie.” How cute is that? 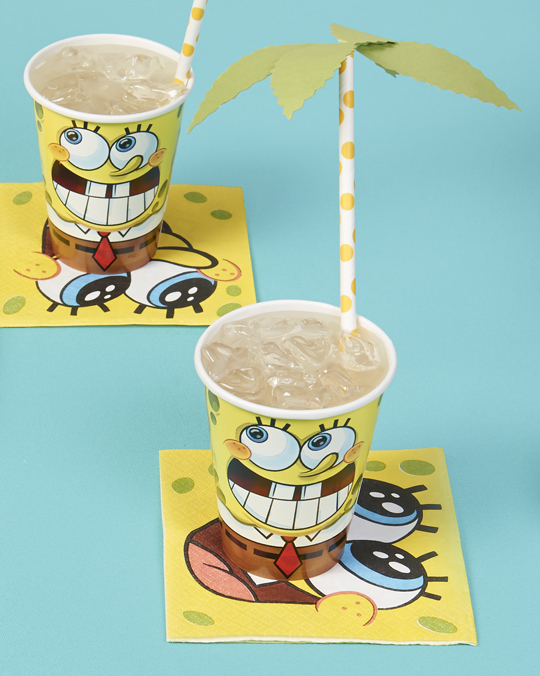 For these palm tree straws, you can use these yellow polka dot straws, or any others you happen to have. Take some green construction or scrapbook paper, and using jagged edge craft scissors (you can get these at your local craft store), cut out several palm leaf shapes, four leaves for each straw. Make one edge of the palm leaves taper off into a thin line. Bend the edge of the thin line and tape each leaf individually to the straw, near the top. If you want to go the extra mile, you could glue a couple malted milk balls on there as coconuts. 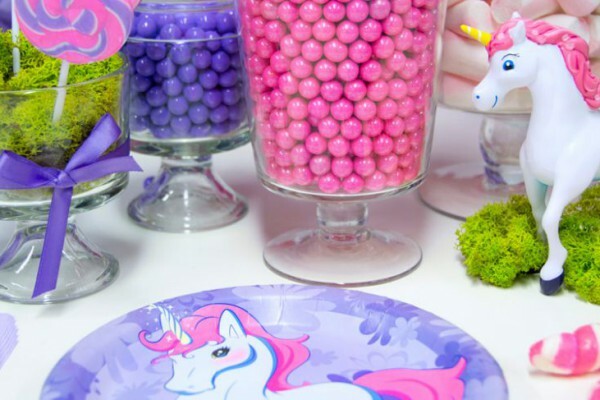 Send the guests home happy with our wide variety of party favors–from sticker activity books, to blowout noisemakers, to paddle balls, to temporary tattoos! You can also get pre-filled favor boxes in case a la carte isn’t your style. 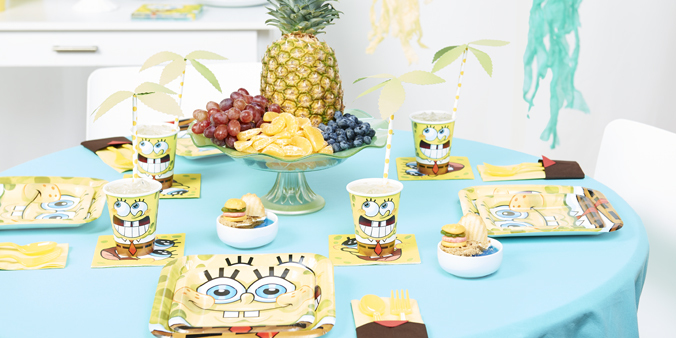 If you’d rather not go for our giant fruit platter centerpiece (including a pineapple house), you can opt instead for this SpongeBob table decorating kit. 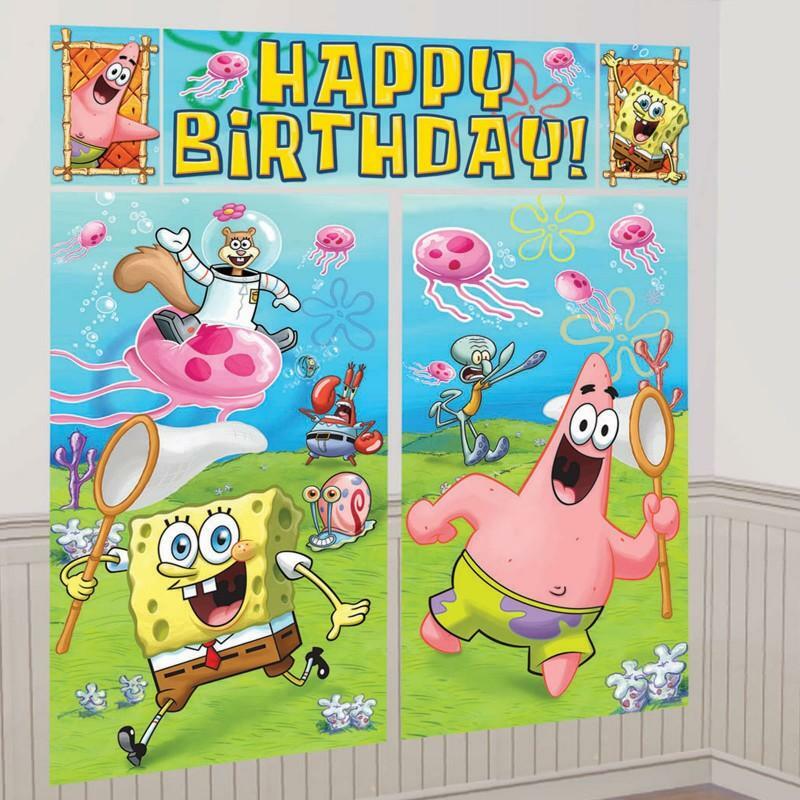 If your walls are looking a little bare, too bare to bear a striking resemblance to Bikini Bottom, try this amazing SpongeBob scene setter. 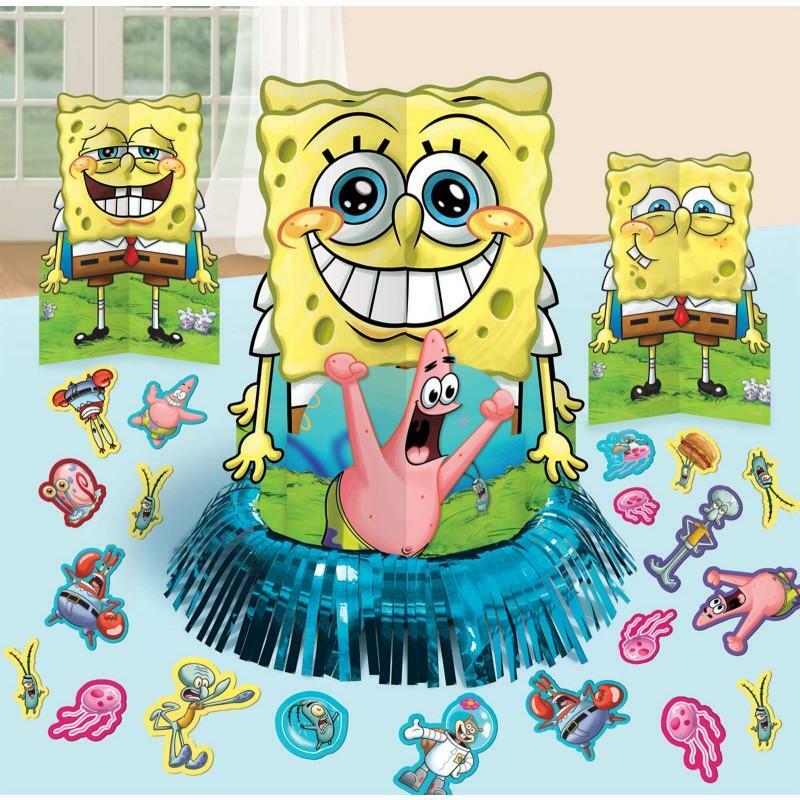 Then add some SpongeBob balloons. It’s not a birthday party without balloons, right? 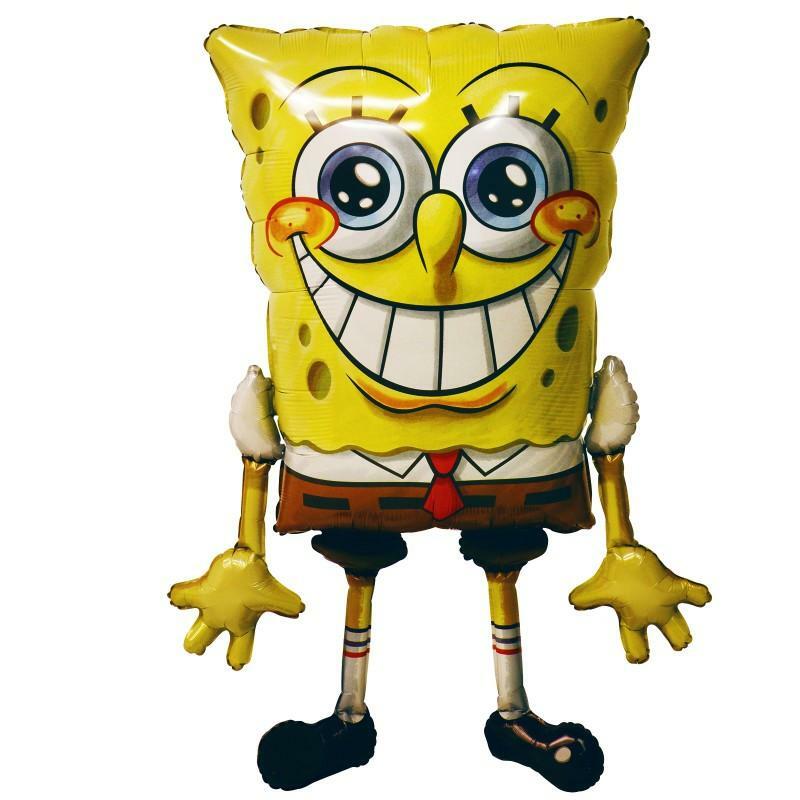 To make the day extra special, get this life-size AirWalker foil balloon. It’s almost 4 feet tall! 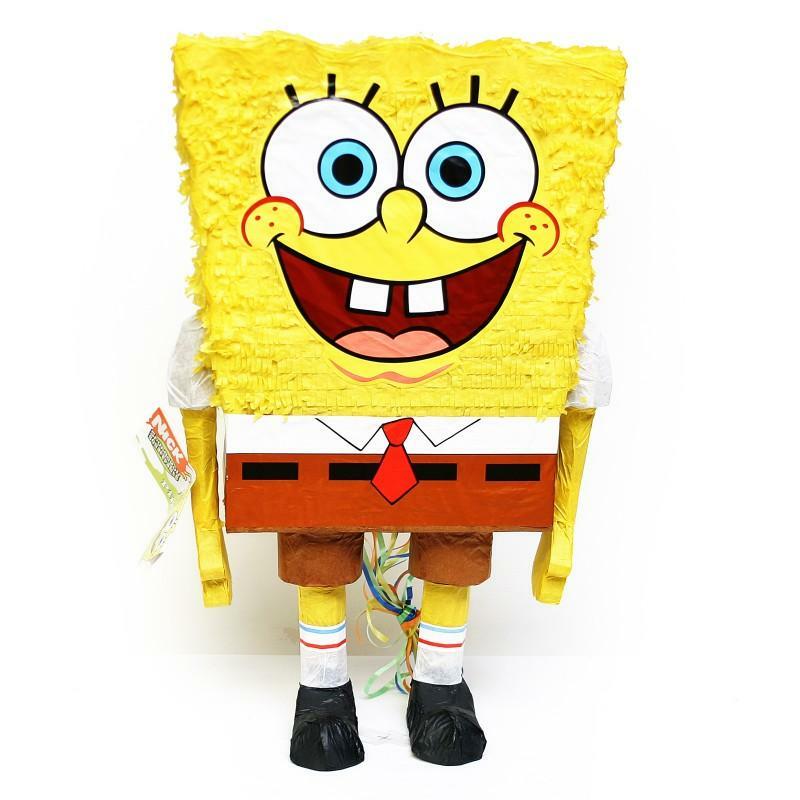 As far as activities go, why not try a party staple, a SpongeBob piñata? We have a fun pull-string piñata, that can also be used as a traditional classic whackable piñata. We prefer to just use the pull-string technique though, because really, how could you want to hit this face? But how about the beach scene up there on the left? The “sand” is just brown sugar, and the seashells are novelty candies and simple sugar cookies that you might find at your local bakery. 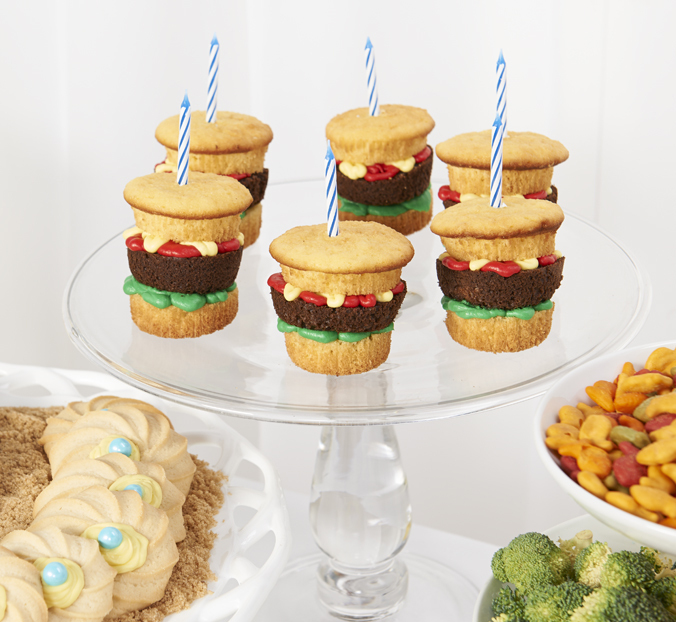 It’s kind of half snack, half decoration. Aren’t they gorgeous? First you need an equal number of unfrosted vanilla and chocolate cupcakes. Cut them all in half. 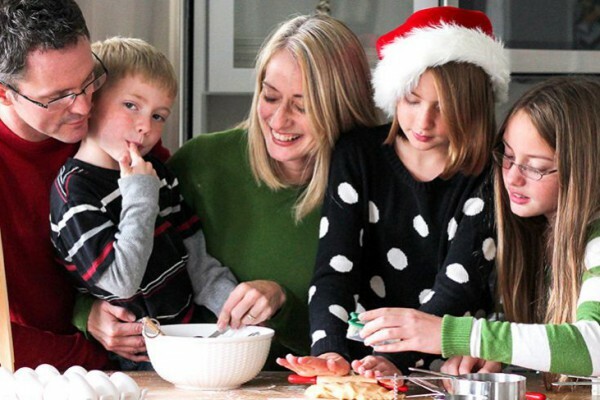 You will also need squeezable tubes of green, yellow and red frosting. 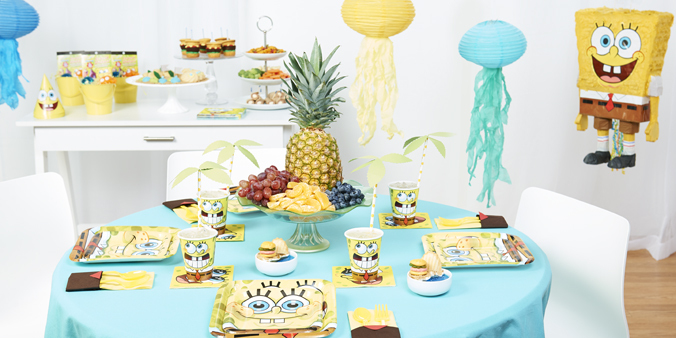 Are you inspired to throw a Bikini Bottom birthday bash for your little SpongeBob fanatic? What kind of party theme should we feature next? If you enjoyed this post and want to see more like it, then follow us on Twitter and Facebook, and tell us what you think! 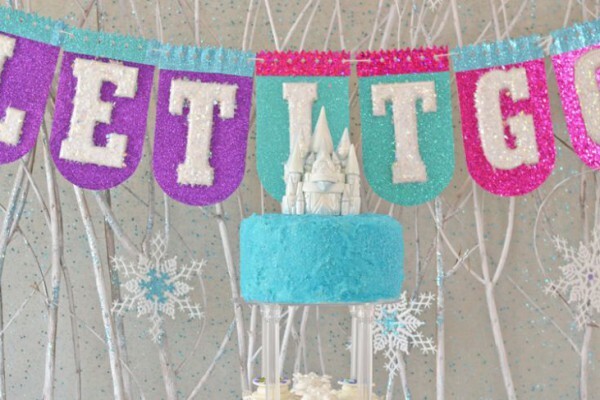 Check out our Pinterest boards for more great ideas, too!